Agona Swedru, Nov 19, GNA - A Swedru businessman who conspired and defrauded Nana Ekow Arhin, Managing Director of Rings Travel and Tour Company to the tune of 338,570,000 million cedis under the pretext of securing him a visa has appeared before the Swedru Magistrate Court. Amos Baiden, charged with abetment of crime was granted bail in the sum of 500 million cedis with two sureties to be justified. He pleaded not guilty and would re-appeare in court on December 1, 2004. Prosecuting, Detective Sergeant R. A. Boamah, told the court presided over by Mr Charles Adjei Wilson that about three months ago, the accused introduced one Yaw Awusi now at large as his brother who was the Secretary to the Special Assistant at the Protocol Section of the Office of the President at the Castle, Osu. He said Awusi succeeded in collecting 338,570,000 million cedis from Nana Arhin under the pretext of securing him visas for 15 people to travel outside the country. 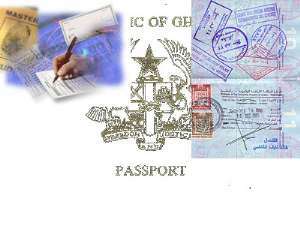 The prosecution stated that the accused and his brother informed Nana Arhin that they could work on the visas faster and this convinced the victim who offered the amount. According to the prosecution the Managing Director's clients later detected that the visas were fake and they returned them, adding that, Awusi managed to escape before the deal was detected.